My personal favorite of the year has been circulating on teh Netz for several weeks now. Hello, Monkey Jesus. This one is kind of douchey, but you have to give the guy credit for chutzpah (and nicely rendered graphics, too). It's Drunk Guy Makes Out With Hottest Chick At Party YouTube Video. I don't know what the rest of these costumes look like, but with makeup like this, it doesn't matter. 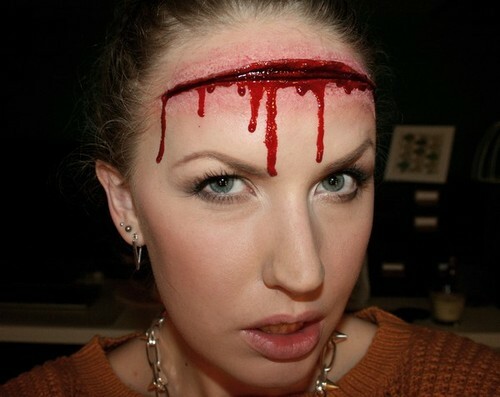 I give you Head Wound Girl and Zipperface Girl. Speaking of makeup, I love love love this costume because it's simple, beautiful, and artsy. I wish I had thought of Roy Lichtenstein Character. 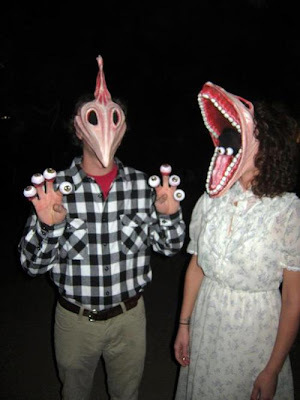 These Beetlejuice-inspired costumes are completely amazing and ghoulishly adorable. 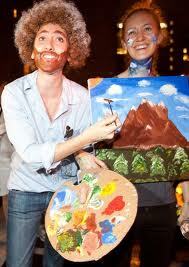 And I couldn't resist posting this one, because I love me some Bob Ross. As you know, Precocious Daughter's costume this year is Hipster Elmo. 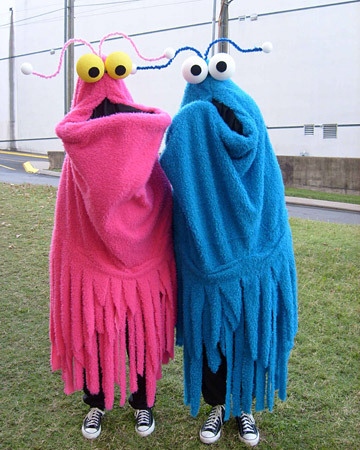 But oh how I wish we had thought of the Muppet Martians. Yip-yip-yip. 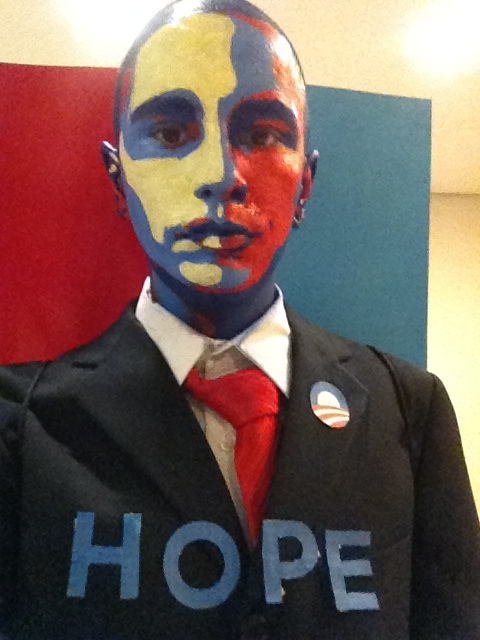 With perfect timing just a week before the election, here's the Obama Hope Poster. I want to take moment to remind the youngsters how damn lucky they are to be living in an era where Halloween is undergoing a renaissance of creativity and fun. Today's costumes are elaborate and entertaining pieces of pop art. 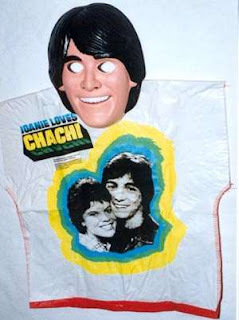 Whereas if you grew up in the 70s, you had to dress up as Chachi. Finally, here's the most incredible costume I've seen this year. What? 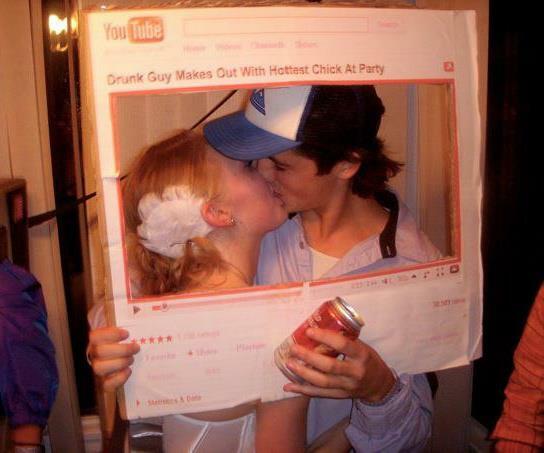 It came up when I Googled "awesome Halloween costumes," so it must be legit. Don't tell me things are not what they seem on the Internet. You're going to ruin the holiday for me. Happy Halloween, Drunkards! Be safe, have fun, and most of all, eat candy until you burst. And if someone dressed as a dirtbag blogger comes to your door, remember that they prefer Snickers Peanut Butter Squared. Now I'm craving a Snickers Peanut Butter Squared. And a donut. But that's unrelated. 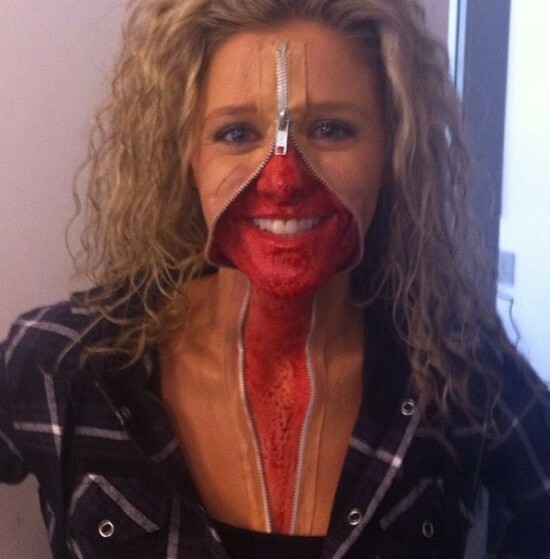 And I'm in awe of zipper face girl. 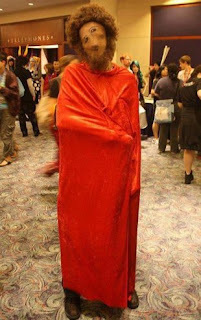 And I'm confused by monkey Jesus - is his face blurry or are my eyes just refusing to focus because of the amount of awesome? I saw a girl with the zipper-face last night. That is an awesomely freakish idea. 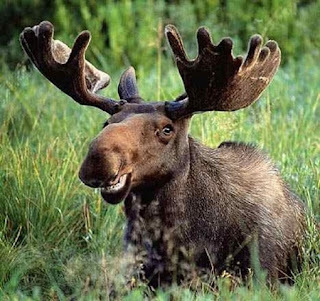 Also - I would totally wear a moose costume on a regular basis. Just because.